It’s a shore excursion Cunard has run a thousand times before – but never like this. 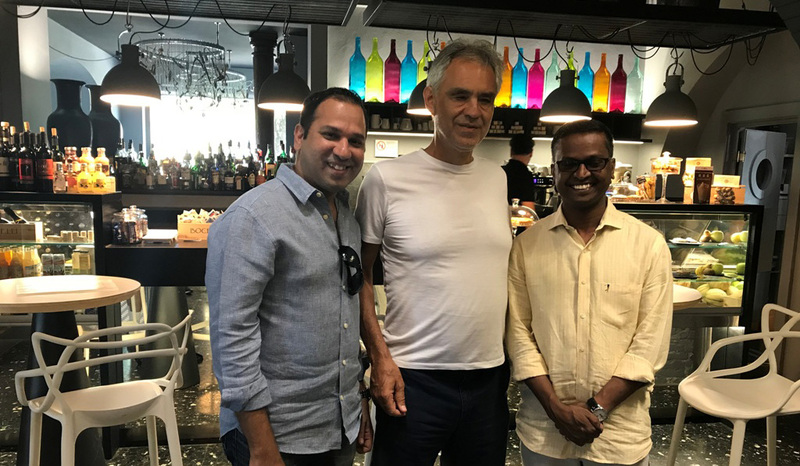 Last month, guests on Cunard’s luxury ship Queen Victoria were happily enjoying some fine wines and finer company during the Bocelli Essence of Wine tour when, in an unexpected surprise, the Maestro himself, Andrea Bocelli, made a rare visit. Indeed, before Andrea Bocelli made a name for himself as one of the finest tenors to grace classical music this century, the Bocelli family were known for producing fine wines for over three centuries. And although his brother Alberto manages the day-to-day running of the vineyard, Andrea still pops in occasionally. Guests took the tour from La Spezia while on board the Queen Victoria’s ‘Mediterranean Highlights’ voyage. It explores the hometown of Andrea Bocelli and gives a glimpse into his life. Spending the day in the heart of the rolling hills of Tuscany, the guests visited Bocelli’s hometown of Lajatico and explored the Bocelli family vineyards with a wine tasting at the Officine Bocelli, the newest restaurant owned by the Bocelli family. Whilst the group were enjoying their tour of the vineyards Andrea appeared to surprise the visitors – a truly unique and memorable occasion for the Cunard guests and proof that anything can happen when you book a cruise.